A gunshot rings out and interrupts Laurel Hayward’s first steps on stage as a professional dancer, and witnessing an assassination is just the beginning of her horrific night. The ruthless killer is determined to either have her or to silence her, landing Laurel in the protective custody of Deputy U.S. Marshal Jason Dunn. His cocky, indifferent attitude gets under her skin, but worse yet, there’s undeniable attraction. Jason can claim he’s not interested in her all he wants but once he’s got her tucked away in a safe house his actions say otherwise. She needs his help to stay alive and he needs her to catch the killer that has eluded him for years. 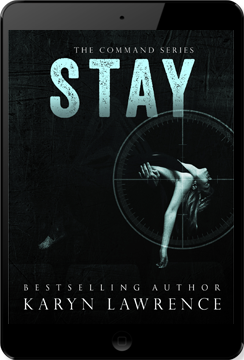 Forced together and on the run, the attraction flares out of control and develops into more just as the obsessed killer comes for Laurel...and threatens to destroy everything. © KarynLawrence.com All rights reserved.